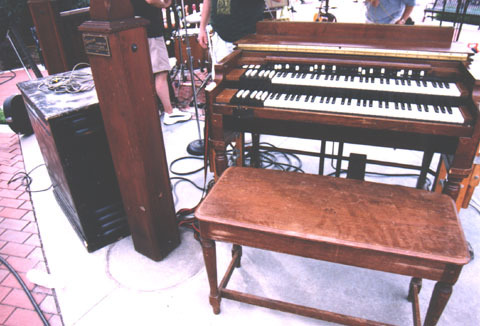 The Hammond organ. That inimitable purr, growl, roar, and scream. That sublime pad behind an acoustic guitar. That full-afterburner smear up the keyboard with all the drawbars pulled out and the Leslies spooling up. That funky, soulful percussive bark that just oozes with chicken grease and brings to mind a trio of hot cats cookin' in a small jazz club. The plaintive wail of gospel playing that gets you on your knees. Synthesizers temporarily supplanted the Hammond in the late 70's through the 80's. It was a dark period for music, with the warmth of true human beings playing true honest songs on real musical instruments giving way to a soulless mechanical repetitious wasteland. This wasteland lives on as techno, rap, and teen pop. But somewhere in the 90's, many artists came back to the Hammond, realizing that this was the sound they wanted all along while being seduced by slick solid-state contraptions. 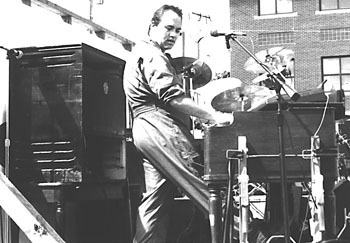 Now not only has the Hammond regained sway with roots-music artists like Bruce Cockburn and Bob Dylan, but even makes its way into mainstream pop music. The Hammond in Jazz has experienced a resurgence as legends like the godfather of jazz organ Jimmy Smith record new albums and up-and-coming giants like young phenom Joey DeFrancesco and Tony Monaco push the envelope of B-3 jazz. To the right is my 1952 Hammond B-2, with my Leslie 45 to the left of it. This is the rig that I use live. The B-2 here has the later smooth drawbars and newer manuals courtesy of a donor '54 C-2. Most -2 consoles have the early "ratchet" type drawbars. The only feature the -2 series lacks is percusssion, and this can be easily added. To the bottom is a pic of yours truly playing the old B-2 at an outdoor concert with Linear Action Band (LAB), a group featuring the songwriting and guitar talent of Ed Englerth. Coming soon - more pics, schematics, a pictorial guide of the innards of Hammonds, and more....stay tuned! Haunted - This is an original Ed Englerth tune that I played with Ed Englerth's Linear Action Band, a Christian blues/funk/folk/rock/etcetra band based in Hastings, MI. The photo of yours truly at the B-2 up in the pics section was taken at that gig. I thought I'd share one of my favorite tunes from that one. Haunted is a funky little ode to irresistable grace. :-) We're currently working on getting LAB back up and running again. Curious - Another cut from that gig. This is a shorter file, about 2.5MB. This is another good tune. Another classic "Ed" tune. Afterburner Productions - I record and do session work, too. Trek II - Manufacturer of accessories and bolt-ons for vintage Hammonds and Leslies. They make a popular percussion add-on for older consoles as well as a fine solid-state preamp that directly replaces a B-3/C-3/A-100/RT-3/D-100 preamp, and can be used to add percussion and restore original audio performance to older Hammond consoles. ProKeys - HamTech list member Steve Leigh's home on the Web. He is known for being fussy to a fault about Hammonds and the refurbishing thereof, but the results speak for themselves. The organs sound unbelieveable. Steve has a cute fox, too. Rick's Hammond House - List member Rick Prevallet's hangout. He's a tech in the Kansas City area and knows his stuff. He maintains the Hammond/Leslie Age Determination List - a must-see. My B-3's on there, #90110. Benton Electronics Service Page - Here are some good how-to tips on maintaining Leslie motors, oiling the tone generator in the Hammond, and even rebuilding a vibrato scanner. James "TheRev" Harton - a good friend of mine. He cooks. Joey DeFrancesco - If you've never listened to this guy's playing, you need to. Get with the program. :-) I saw him live. Amazing. My jaw was on the floor most of the night. Tony Monaco - This guy is scary. Jimmy Smith - 'nuff said. 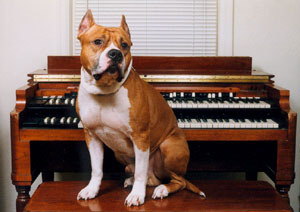 Scott The Organ Freak - Scott Hawthorn, another HamTech list member. Lots of jazz stuff here, including organ bass lessons. Scott knows his stuff, and is a good player too. This site hosted by http://theatreorgans.com Please visit them and support our sponsors!